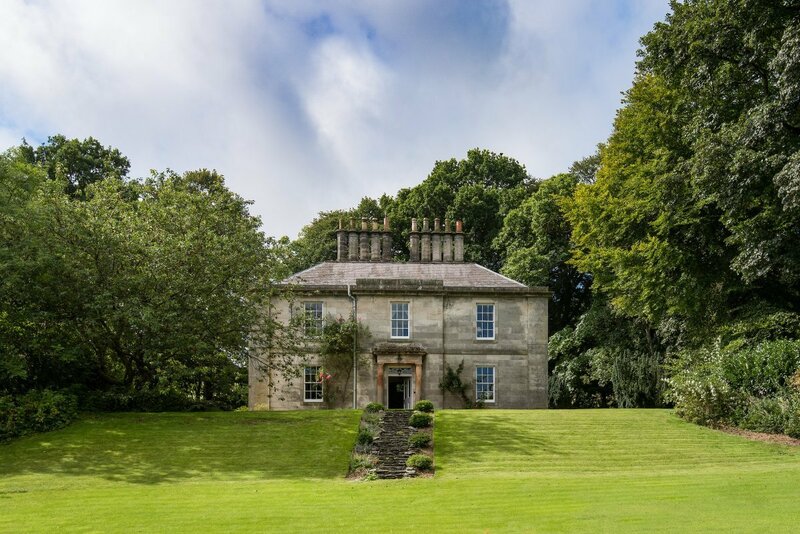 Howford House, Innerleithen, Peeblesshire, sleeps 12-18 in 9 bedrooms. 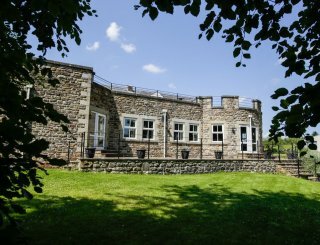 This elegant Georgian country house, Howford House, offers a stylish, comfortable and spacious setting for family holidays and short breaks with large groups of friends. 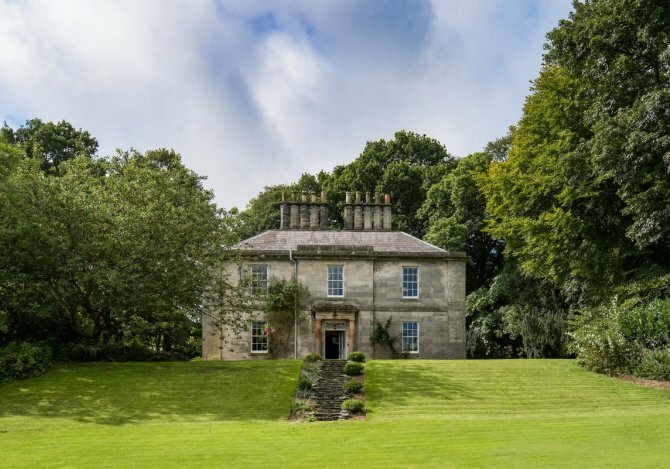 The house is set above a sloped lawn, surrounded by trees, and with an open view across the Tweed valley and the River Tweed. 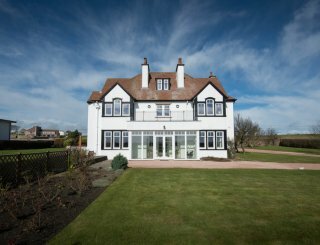 With a formal appearance from the outside and a relaxed air within, this holiday house was renovated and refurbished in 2016. On entering by the front door, the house offers a grand hall which presents a mix of antique furniture and modern art, and this eclectic theme carries on throughout the whole house. The two front rooms are the main reception rooms, with an L-shaped drawing room and a classic dining room. To the rear is the country style kitchen and utility room, which can be accessed by a side door, making it more convenient for kitchen access with food shopping. 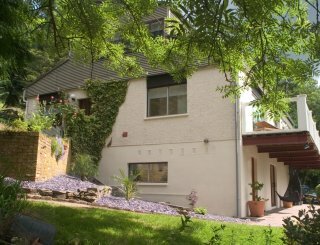 With ramp access to the side of the house, there is a wheelchair friendly ground floor bedroom, with nearby accessible shower room, with the entire ground floor being accessible too. The rest of the accommodation is markedly distinct. On the first floor to the front of the house are the 4 main bedrooms; to the rear on the first floor are bedrooms that are classified as the 2 maid’s bedrooms; and on the second floor are the two attic bedrooms, which make a good family suite. This is a pet friendly holiday house and dogs are allowed access at ground floor level. 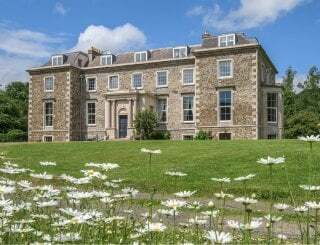 The private grounds make a great space to relax in, whilst guests are also invited to use the historic grounds and tennis court at Traquair House, a short walk away. Traquair, Scotland's oldest inhabited house, also has facilities for weddings and fine dining which are offered to guests at preferential rates. 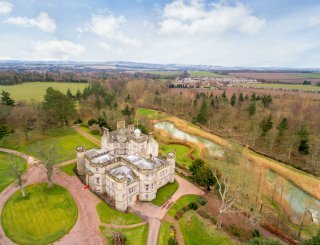 The Tweed Valley in the hills of the Scottish Borders offers an excellent range of activities nearby from mountain biking, walking, cycling, fishing (salmon and trout), golf and horse riding. Fully equipped farmhouse country kitchen equipped with oil fired Aga, electric cooker, microwave, 2 fridge/freezers, dishwasher. Dining room table seats 12 with additional table which seats 6. 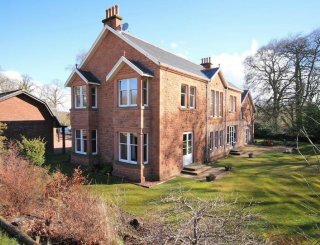 A large expansive L-shaped room, with an open fire and lovely views to River Tweed. Furnished with antique furniture and baby grand piano. TV/DVD player and baby grand piano in sitting room. CD player/radio in kitchen. Mobile reception good. No landline. Broadband available on ground floor. No games room. Selection of board games available. Use of tennis court nearby. Large garden. Open fire in sitting room and logs provided. 9 double bedrooms: 7 bedrooms can be configured with twin or king size doubles. 2 attic rooms with 2 beds (1 attic room with small singles). 5 bathrooms including 3 with baths and 2 with shower only. Ground floor bedroom and shower/bathroom are fully accessible with ramp leading into bedroom if required. All ground floor accessible. Cots and high chairs can be provided. Large garden area with barbecue and seating. Outdoor table tennis table. Hot tub can be hired in if required. Tennis court at Traquair House nearby. Ample parking for 6/8 cars off main road. Smoking permitted outside the property only. Dog are permitted in ground floor areas only. Situated on the B709 in a rural location next to Howford Farm and with its own drive, 10 minutes walk to Traquair House. 50 minutes from Edinburgh Airport, in the Scottish Borders. Innerleithen 2.5 miles, Peebles 6 miles, Edinburgh 26 miles. Cardrona Village Shop - 2 miles. Innerleithen Co-op, Peebles Road, Innerleithen - 2 miles. Tesco will deliver to door. Traquair Arms Hotel, Innerleithen, 2 miles. We require 25% of the full rental to secure the booking and remaining cost to be paid 8 weeks in advance of your stay. 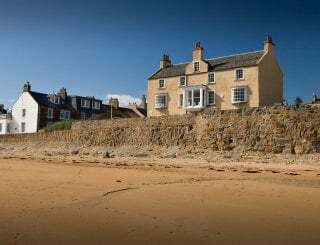 In addition we ask for a £500 housekeeping deposit to be lodged with us in advance and which will be returned within 1 week after your stay to ensure cover for any damage. Galashiels 15 miles, Edinburgh Waverley Station 30 miles. Cardrona Village 2 miles X 62 to Peebles/Edinburgh or Galashiels/Melrose run every 30 mins. Approx 1 hour 10 mins on bus to City Centre.